Enables two HDTV displays and speakers to be driven by a single component YPbPr video device with stereo audio or digital audio. 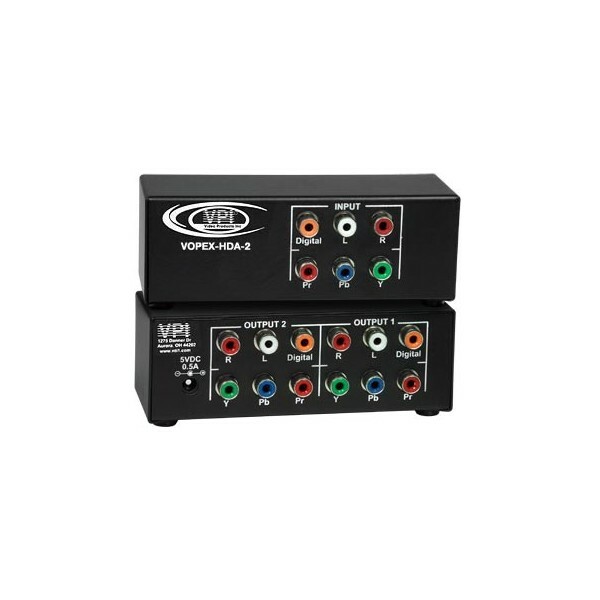 The Component Video / Audio Splitter enables two HDTV displays and speakers to be driven by a single component YPbPr video device with stereo audio or digital audio. 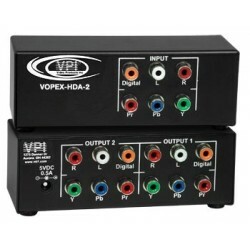 Each input and output has component YPbPr video, L/ R analog audio, and digital audio on coax (S/PDIF). Supports High Definition and Standard Definition component YPbPr video, S-Video or composite video. Supports S/PDIF, DTS Digital Surround™, and Dolby Digital™ 5.1 digital signals. Supports numerous resolutions: 480i (interlaced), 480p (progressive), 720i, 720p, 1080i, and 1080p formats. 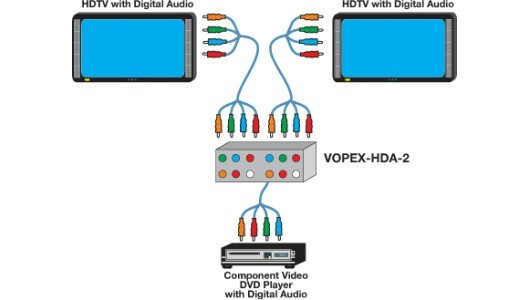 All audio/video inputs and outputs have RCA cable connectors. 110 or 220 at 50 or 60 Hz via AC adapter. Inputs and outputs must be of the same format. Inputs and output must be of the same format. Frequency Response: +/-0.03 dB, 20 Hz to 20 kHz. Total Harmonic Distortion + Noise (THD+N): 0.03% at 1kHz.